“The barrow was circular, measuring about eighty yards in circumference, the diameter sixty-two feet, and the height nine feet; it had however been considerably reduced by the plough. Upon clearing a section across the centre, the following formation presented itself. The outside circle or foot of the barrow was of chalk, occupying a space of fifteen feet towards the centre. There was then a wall extending completely round, and enclosing an area of about thirty feet in diameter, composed of large masses of sandstone brought from some part of the heath, probably from Lytchett, a distance of not less than five miles, and across the river Stour. These stones were well packed together as in the foundations of a building, and the interstices tightly filled with flints. Within this wall, for the space of three or four feet, was a bed of flints, without any mixture of earth or chalk, packed together from the floor to the surface of the barrow, having only a few inches of earth above. The remainder of the interior was occupied by large sandstones, serving to protect the various interments. “About the centre I found six deposits. The most northern of these was the skeleton of a young child, by the side of which, proceeding west, there was a cist containing a deposit of ashes and burnt bones; and near it another, rather above the floor, containing burnt wood. Immediately beneath this was a cist containing an urn, placed with its mouth downwards, and filled with burnt bones, which were perfectly dry and white. It was without any ornament, and measured in height ten and a quarter inches; the diameter at the mouth, which turned outwards, was eight and three-quarter inches, and at the bottom four inches. The other cists contained burnt bones and ashes. Sandstones had been placed over them, but were removed without my having an opportunity of ascertaining their position. A short distance south of these deposits there was a cist containing the bones and skull of a young child, over which had been placed a flat sandstone, and about a foot from it appeared a deposit of small bones, occupying a space of only two feet ; these were apparently the remains of a woman. Immediately above was a row of sandstones, resting, as was usual throughout the barrow, upon a thin layer of burnt wood. At this spot the barrow appeared to have been opened after its final formation, as if for the purpose of a subsequent interment, and filled up, not with the earth of which the remainder was formed, but with loose chalk, there being no stones or flints above those which lay immediately upon the deposit. At the extreme south of these cists was a large sandstone, three feet in diameter by sixteen inches in thickness, placed edgeways. The above-mentioned cists were circular. 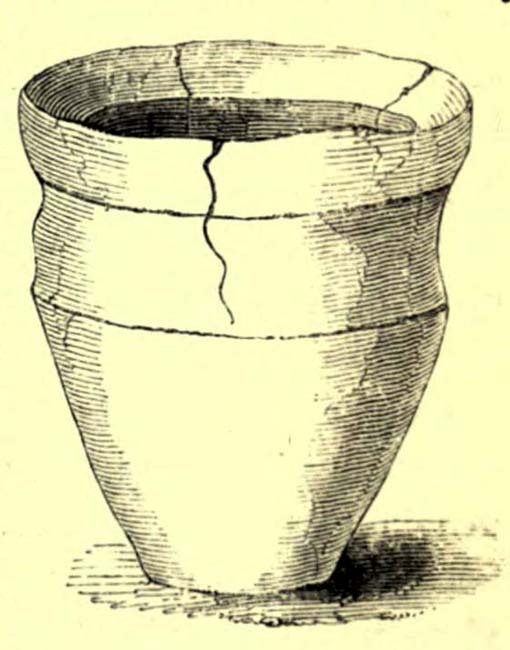 “A few inches west of the cist described as containing an urn, was the lower half of another, measuring in diameter five and a half inches, inverted, and placed upon the floor of the barrow, without any protection, merely surrounded by a thin layer of ashes and then the solid earth. It was filled with ashes and burnt bones, and rested upon the parts of a broken skull. Near this was an urn, also unprotected, and consequently much injured by the spade. It was placed upright, and measured in diameter nine and a half inches, by about ten inches in height. In form it resembled the urn first described, marked with impressed dots, but it was without any ornament. A short distance from these was a deposit of burnt wood at the west side of a large flat stone, placed edgeways, which measured three feet four inches by two feet ten inches, and thirteen inches in thickness. From its appearance it would seem that the fire had been lighted by its side. Immediately beneath the edge of this cist, and resting upon the chalk, was a small urn inverted, and by its side some small human bones. It was wholly unprotected, and unfortunately destroyed. South-east of this was a cist sixteen by twelve inches in diameter, and eighteen inches in depth, containing ashes and a few burnt bones, with a large-sized human tooth. Close to the edge of this cist, upon its western side, was placed in an upright position, a large stone measuring in diameter three by two and a half feet; and leaning against it another of still larger dimensions, inclining towards the north. This measured six and a half by four feet, and fifteen inches in thickness. About three feet further east were two large stones set edgeways, and meeting at their tops. Beneath them was the skeleton of a small child with the legs drawn up, lying from west to east. 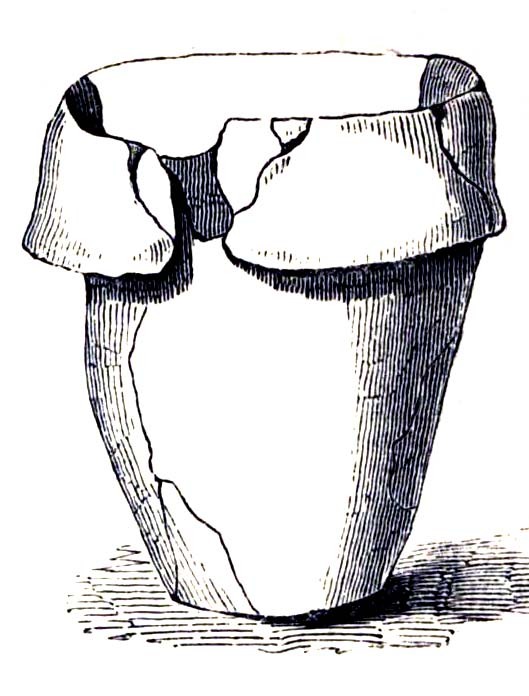 At the north-west side of the barrow, about five feet within the wall, was a cist cut in the solid chalk, measuring sixteen inches in diameter by sixteen in depth; it contained an urn inverted, and filled with burnt bones. Though carefully bandaged, it fell to pieces upon removal, being of more brittle material than any previously discovered. The clay of which it is formed is mixed with a quantity of very small white particles, having the appearance of pounded quartz. It measured in height nine inches by nine and a half in diameter, and is ornamented by six rows of circular impressions made with the end of a round stick or bone of a quarter of an inch in diameter. The cist was filled up with ashes. “A few inches from this was a cist differing in form, being wider at the top than beneath, in diameter eighteen inches by eighteen in depth; a flat stone was placed over it. It contained the skeleton of a young child, laid across, with the legs bent downwards. Lying close to the ribs was a small elegantly-shaped urn, measuring four inches in height by four in diameter, and made of rather a dark clay. It is ornamented with a row of small circular impressions, similar to those mentioned in the last instance, close to the lip, which turns rather out: beneath is a row of perpendicular scratches, and then two rows of chevrons, also perpendicular. At the feet of the skeleton was a peculiarly small cup, measuring in height one and a half inches by two and a quarter in diameter. It is ornamented with two rows of pricked holes near the top, beneath which is a row of impressions, made probably with an instrument of flat bone, three-eighths of an inch in width, slightly grooved across the end. The same pattern is at the bottom and upon the rim. “Near this, towards the south-west, was a deposit of burnt wood, situated above the floor of the barrow, and immediately beneath it were two cists. 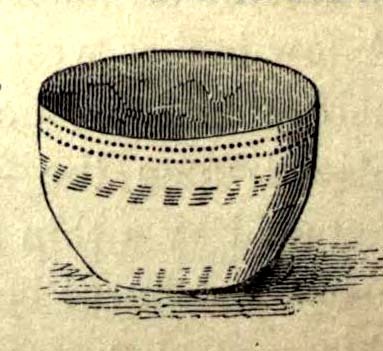 In one of these, which measured two feet in diameter by one and a half in depth, were a few unburnt bones and several pieces of broken pottery, with a small cup, ornamented with three rows of the zigzag pattern, betwixt each of which, as well as upon the edge, is a row of pricked holes, and at the bottom a row of scratches. It measured in height two and a half inches by three in diameter, and had two small handles pierced horizontally: there appeared to have been originally four. 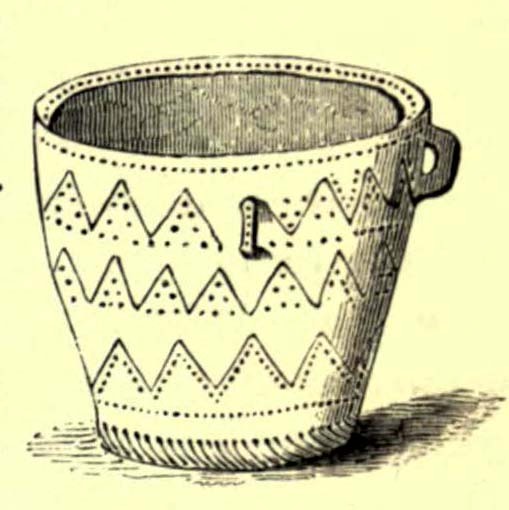 In the other, which measured two feet in diameter by one in depth, were a few unburnt bones and a small urn placed with the mouth upwards, measuring four and three-quarter inches in height by the same in diameter. The lip, which turned very much out, is ornamented with a row of scratches, both within and upon its edge, a similar row also passes round near its centre. Close upon the edge of this cist was another urn of similar dimensions, inverted, and embedded in the solid earth without any protection. It is of much ruder workmanship than any of the others, and wholly unornamented, measuring five inches in height by five in diameter. Both these urns inclined equally towards the south-east. These last cists were partly, if not quite, surrounded by large sandstones set edgeways, and smaller ones built upon them, forming as it would seem a dome over the interments, filled with earth, and reaching to the surface of the barrow, where these stones have been occasionally ploughed out. 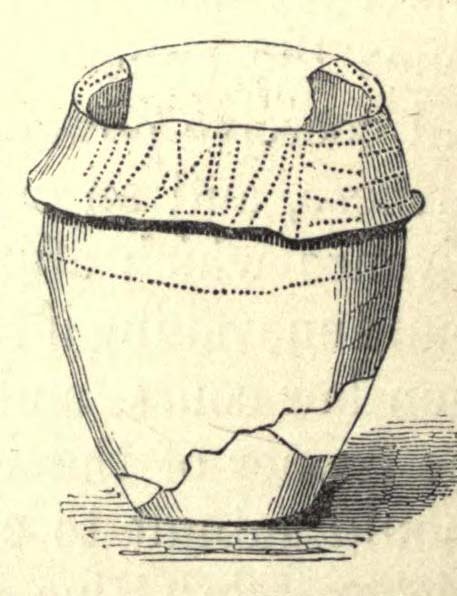 From this circumstance, as well as the general appearance of the excavation, added to the description given by the labourer of the other part of the barrow, I am induced to suspect such to have been the case throughout… I found many pieces of broken pottery, and a part of a highly-ornamented urn. There was a total absence of any kind of arms or ornaments. The labourer however shewed me a round piece of thin brass, which he had found amongst the flints within the wall, measuring an inch and five-eighths in diameter. It had two minute holes near the circumference. It was probably attached to some part of the dress as an ornament. Teeth of horses and sheep were of frequent occurrence; I also found some large vertebrae and the tusk of a boar. Upon one of the large stones was a quantity of a white substance like cement, of so hard a nature that it was with difficulty I could break off a portion with an iron bar. “If I offered a conjecture upon its formation, I should say that the wall, and foot of the barrow, which is of chalk, were first made, and the area kept as a family burying-place. The interments, as above described, were placed at different intervals of time, covered with earth (not chalk) or flints, and protected by stones. And over the whole, at a later period, the barrow itself was probably formed. My reason for this opinion is, first, that all these deposits, including, as they do, the skeletons of three or four infants, could scarcely have been made at the same time. And in the second place there was not the slightest appearance (with one exception) of displacement of the stones or flints in any way. As these circumstances then would suggest that the interments were formed at various periods, so the general appearance leaves no doubt as to the superstructure of flints, and surface or form of the barrow itself having been made at the same time and not piecemeal. One of the stones inside here was later found to possess “carvings of five cupmarks, two bronze daggers and two flat, triangular axes of early Breton type,” (Burl 1987) which Austen didn’t seem to notice at the time of his investigation. A profile of the Badbury Barrow carving can be found here. In Peter Knight’s (1996) survey of megalithic sites around Dorset, he includes the Badbury Barrow along a ley line that begins at the tumulus just below (south) Buzbury Rings and then travels ESE for about 5 miles until ending at another tumulus at ST 006 996. Piggott, Stuart, “The Badbury Barrow, Dorset, and its Carved Stone,” in The Antiquaries, volume 19, 1939. This entry was posted in Cairns, Tombs, Tumuli, Dorset, England (south) and tagged antiquities, Archaeology, Badbury, Bronze Age, burial, cairns, death, Dorset, earth mysteries, english heritage, excavations, ley-lines, leys, necropolis, neolithic, prehistoric rock art, prehistoric sites, ritual sites, sacred sites, Shapwick, tombs, tumuli, tumulus, urns. Bookmark the permalink.